Hope you like this small overview / insight in the 12.2.0.1 version of the database. Have a go at it via Oracle’s Exadata Express Cloud Service. So what did we have in the 12.1.0.2 database version? 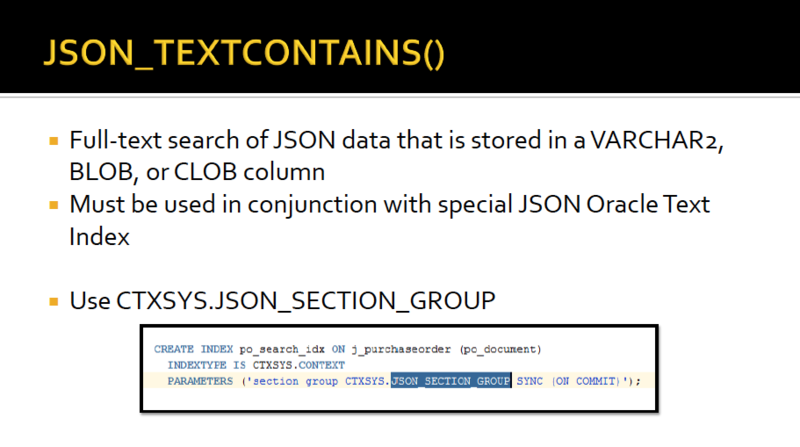 Database 12.1.0.2 introduced JSON Text Index support via a Text Index “CTXSYS.JSON_SECTION_GROUP” context group definition. If used in conjunction with JSON_TEXTCONTAINS( ) one could use Oracle Text select statements, operators, to find and search the JSON content. It will create a search index, a JSON dataguide, or both at the same time. The default behavior is to create both. So in short the statement above, leaves only the search functionality enabled (dataguide now disabled), and represents the new improved 12.2.0.1 version of the Oracle Text index JSON version available in 12.1.0.2. 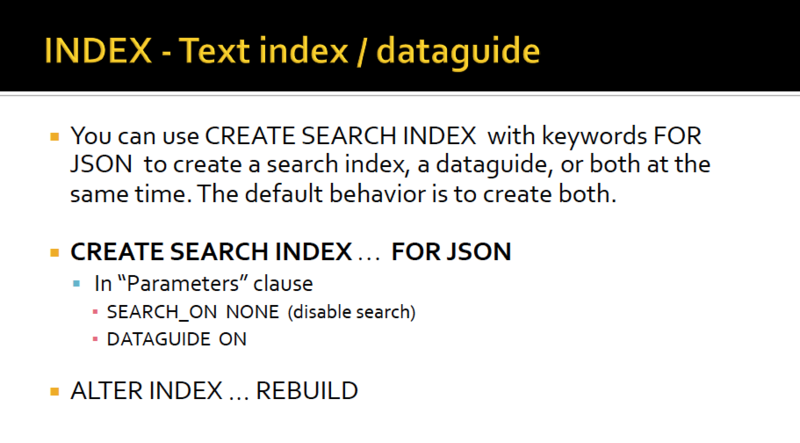 So up till now we have 2 options for influencing the functionality of such an Oracle Search index for JSON: “search” and “dataguide”. But there is currently also a third one for use with virtual columns. The following example is from the (JSON) hands-on labs during Oracle OpenWorld 2015 and this year, 2016. This example of the “create search index” statement will cause virtual columns to be automatically added to the base table. These virtual columns will contain the relational projected content of your JSON data. The In-Memory Column store can use this content of the virtual columns to it in memory. Indicates whether virtual columns are created based on the dataguide. Specifies the function to be executed when the dataguide changes. Turns the dataguide tracking ON or OFF. Indicates CONTAINS search only. Only $I is created. Indicates CONTAINS + RANGE_SEARCH_ENABLE with ALL option. dataguide only and no index tables..
IS JSON check constraint is required for creating an index with simplified syntax. TEXT_VALUE in short means “strings and numbers”. I realise that I, intentionally, left a lot to be still explained. For example: “What is JSON Dataguide…?“. If I really wanted, for now, to go into that, this blog post would become waaaaayyy too big, so I will explain this in separate blog posts. 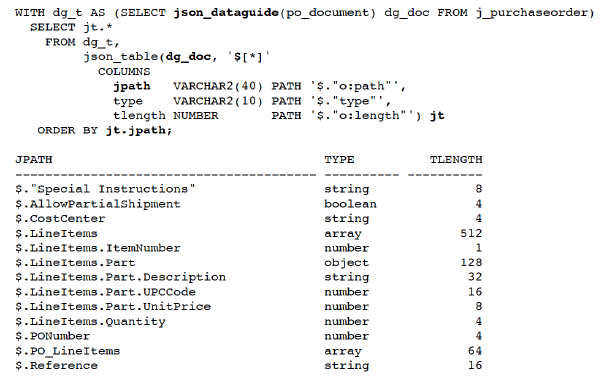 The JSON Dataguide allows you to discover information about the structure and content of JSON documents stored in the Oracle Database.